Associate Staff/ Work-Exchange is a position available to those with a basic knowledge of clay working methods and familiarity with the workings of a pottery studio. Our Associate Staff / Work-Exchange staff are scheduled for 6 hours of studio work per week with responsibilities that center on studio hygiene, maintenance and also include other technical duties based on the level of experience that one has. This position is an opportunity to increase your knowledge and experience is all aspects of studio operation and clay working methods through our training and your exposure to the daily operations in the studio. 24/7 studio access is granted. Materials and firing is charged at our cost. 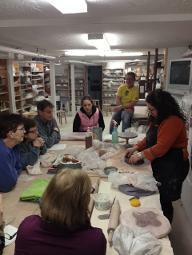 To apply for an Associate Staff / Work-Exchange position, email or snail mail a letter explaining your interest and describing your pottery and studio experience including any formal clay education that you may have. Be sure to include all of your contact information. 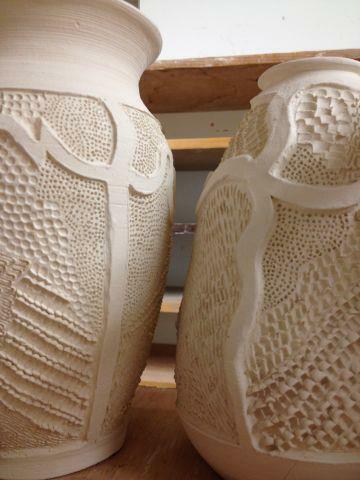 Include two references, one personal and one clay related, with their contact information. Internships are available to high school and college students and in special cases to post graduates and those long out of academic situations. If you are a student, an internship here may be scheduled to fulfill a senior project or off campus independent study experience as part of your degree or graduation requirement. If you are out of school, your internship may serve as a bridge between your previous formal academic and studio education and the next step in your career. 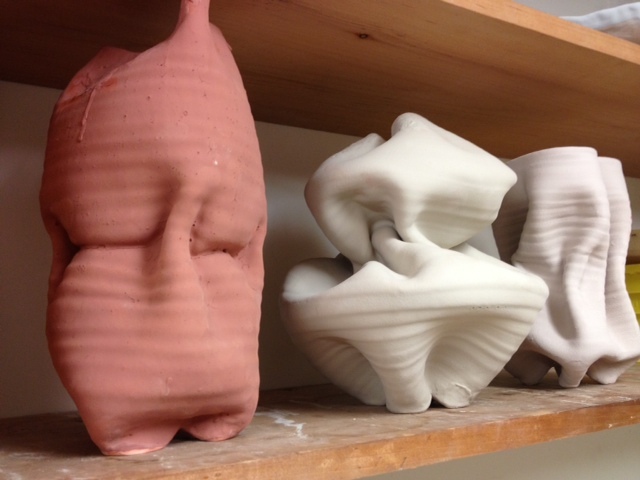 Depending on where you are in your education and your previous experience in a studio situation, an internship will introduce you to the workings of a professional pottery studio including studio design, business organization, maintenance of equipment, customer service, teaching, gallery installations and management, and more. 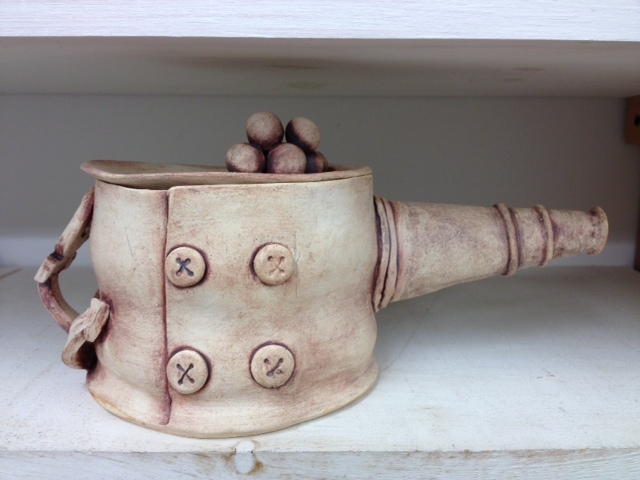 Internships involve a combination of tending to studio chores and time to devote to your own art. The intern will work closely with our staff on a daily basis and will be personally mentored by the founder and director of the studio, master potter Steven Branfman. A key component of the internship program is working with the individual on their clay working skills through hands on instruction, coaching, critique, conversation, and observation. Though the intern works at their art independently, participation in one of our regular adult classes is also available to augment the individual instruction. Advice and guidance in identifying and choosing post secondary and graduate education is also offered if desired. Many of our interns have gone on to art school, to pursue MFA programs, residencies, formal apprenticeships, are teaching in a variety of venues, have established their own studios and are actively marketing and selling their work. Click the link below to download a PDF version of the description and application process. Availability: Internships are available throughout the year for a 3 month minimum and 1 year maximum time commitment. Internships may be extended for an additional year. Responsibilities/Scheduling: The intern is responsible for 6 hours per week of scheduled studio work hours during which studio chores are tended to. Those scheduled hours and studio responsibilities are established on an individual basis. The intern is also expected to work during special studio events such as gallery openings, open studios, etc. Additional time for meetings with the intern for instruction and critique are also scheduled on a periodic basis. Using the studio for ones personal work time is up to the intern and available 24 hours per day. Dan Falby - former intern and current associate staff member. There is no deadline to apply. Internships are available on an ongoing basis. - A cover letter that includes the reason for your interest in The Potters Shop & School, and your experience with clay; throwing, handbuilding, sculpture, knowledge of raw materials, mixing glazes, loading and firing kilns, and any other technical knowledge or experience. -Ten images with brief explanatory notes of the work. -Names and contact information for three references; 1 personal and two professional/educational. PottersSchool@aol.com with the subject line: Internship application. Please feel free to contact us with any questions prior to submitting your application. Applications are reviewed as they are received. The applicant can expect a reply within a few days after submitting their materials. Mariam teaching a handbuilding workshop to members. Evaluation: Interns are evaluated on a periodic basis both informally and formally through discussion, critique, and written comments if required or requested. Fees/Costs: The Internship Fee is $500/quarter. This includes all materials and studio member benefits. Firing charges are additional and charged at a reduced rate. There are no other charges for class or workshop registration or participation. NOTE: There is no housing offered other than assistance in helping to find local housing possibilities. Other Opportunities: Depending on ones qualifications and experience, there may be opportunities for the intern to teach classes and/or special workshops. A teaching fee would be paid to the intern for these services. Also work may be put on display in our gallery for purchase.